Designed for whole-house audio systems or commercial/retail environments, the TSM8 is a powerful yet affordable dual source zone speaker selector that allows you to connect up to eight pairs of speakers (eight listening zones) and select the zones with front panel push-button controls. 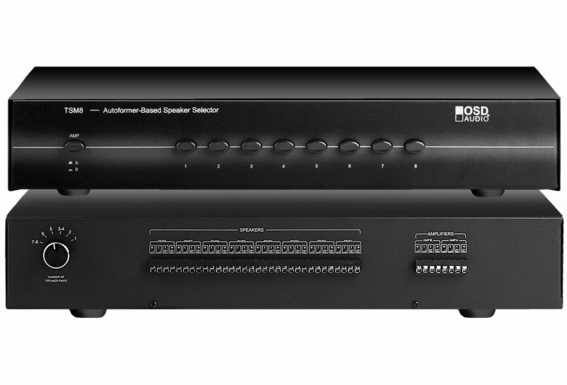 A passive device that connects to a high-current amplifier and is compatible with in-wall volume controls, the TSM8 speaker distribution system also includes dual source switching (A/B) so you can choose between two audio amplifiers as well as individual on/off switches for each zone. This high-power speaker selector is equipped with a low-frequency protection circuit to reduce subsonic signals so you can drive multiple pairs of speakers without going below safe impedance ratings. Going below the impedance rating can overheat or even damage expensive equipment or cause the amplifier to automatically shut off. 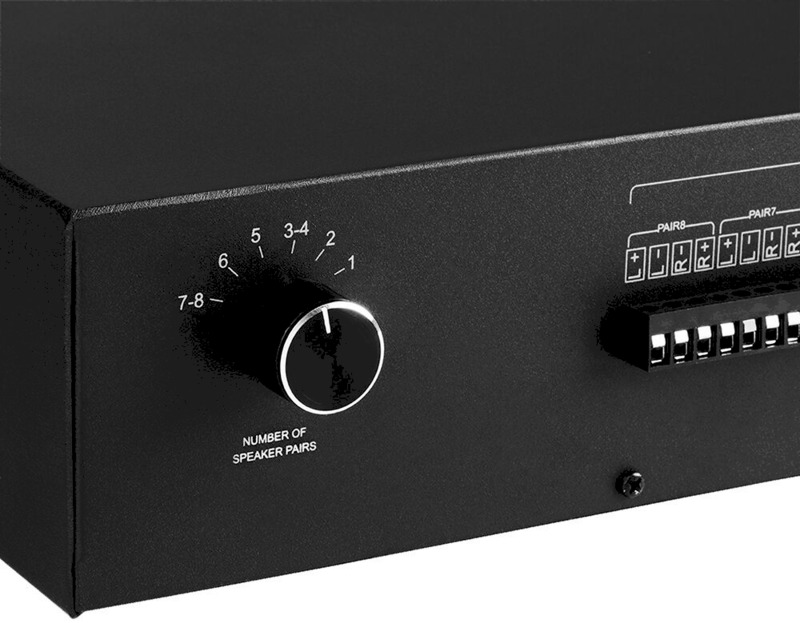 The TSM8 utilizes audio-grade impedance-matching autoformers to safely distribute maximum power throughout your system, and a rotary switch located on the rear panel can be used to set the appropriate impedance to be seen by your amplifier based on the number of pair of speakers connected. Accepts up to 14-gauge speaker wire, the TSM8 includes removable 4-pole color coded snap-in amplifier and speaker connectors for ease of installation when terminating. Another feature popular with our customers are the included die-cut labels that can be attached to each button to identify each listening, for example kitchen, patio, etc. Hi, I have 5 pairs of 8Ohm speakers matched to a 4 ohm amplifier. I will wire my speakers in parallel which will bring them down to 4ohms- so what is the setting I would need to set this selector to in order to match the ohms? Is there a 70V version of this? Hi ben-Nabiy: This is not a 70V speaker selector. WE are developing a true Mono 70V 2 zone speaker selector with through output so you can stack multiple 2 zone selectors (you would need 4 to equal 8 zone TSM-8). 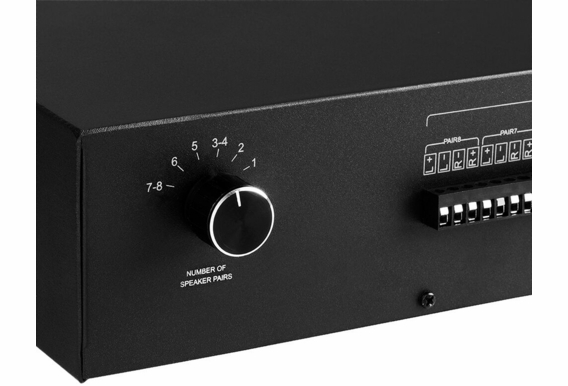 It features 2 of our MVC-100 100 watt mono 70V Mono Volume Controls. It features an on/off switch for both zones. A single input an a direct pass thru for adding an additional speaker selectors or our MVC Volume Controls which feature a pass thru output as well. We hope to have these available by June 2017. 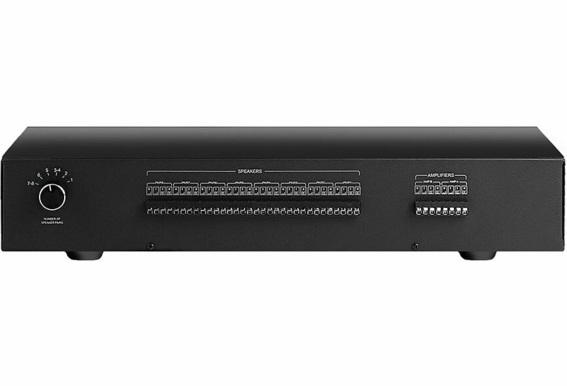 TL/4312 You can also checkout our SPW8 which is an 8 zone patch bay, strictly a Parallel connection box, 8 stereo zones, no internal protection. I have 5 VMS300 VC's controlling 5 pair of 8ohm speakers. If I use this TSM-8 selector, what do I set the impedance matching switch to in each VC and what do I set the number of speaker pairs knob to on the back of the selector? Hi Mark, Well, that's a bit tricky since both components have impedance protection. Ideally you would want to run the impedance matching from only one component (i.e., speaker selector OR volume controls). I would set each vc to 1/2x and then set the speaker selector to the appropriate number of speakers running. I am connecting a 7.2 receiver to 13 speakers. zone 1 will be the main 5 speakers and a subwoofer on the surround side of the receiver.... On zone 2, I want to use the TSM-8 for the remaining speakers, actually 3 different pairs and 3 singles, all with impedance matching volume controls. will this work for me? I have a situation where I need to connect 2 of these units to the same amplifier. How will this affect the load seen by the amp? All of my speakers are 4 ohm on both Autoformers. My amp is 4 ohm stable. Would I set each unit so that independently, they would provide an 8 ohm load, thus when combined on the input channel, the load would be 4 ohm to the amp? Pls help. I do not want to let the MAJIC (smoke) out of my sound system. 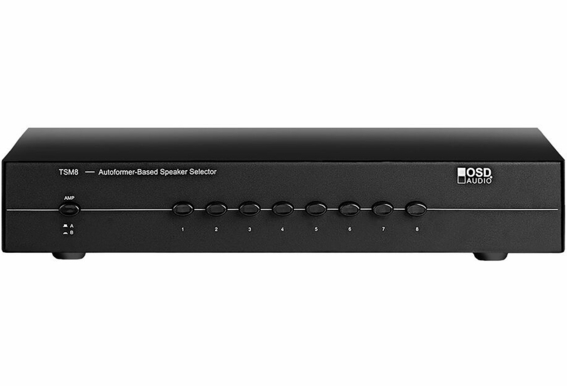 I have just purchased one of these from recommendation from an asked question of somebody else, for use with my soon to arrive Sonos Connect system. 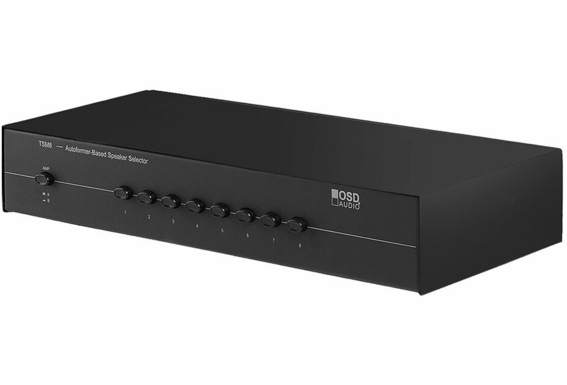 I want to use my Sonos Connect to feed my own amp (yet to buy) which will then feed this TSM-8 which will distribute for the time being to just 3 different rooms, two speaker in each room all 8 ohms via wall mounted volume controllers. Is this going to work!? Will I be able to run as many of the 3 rooms as I like at a time with flexibility to add 5 more in the future? Should I be able to test the ohms coming out with a multi-meter? I have installed this box for my system and have 8 speaker pairs hooked up to it. The speakers are 8 ohm speakers and the amp is an 8 ohm amp. If I understand correctly, after I have all 8 speaker pairs hooked up and I turn the dial to 8 speaker pairs, I should be able to test the Ohms coming out of the Amp by putting the multi-meter into the Amp A or Amp B circuitry. Unfortunately, I'm getting a reading of 0 ohms so I'm assuming something is wrong.